One of the greatest treasures that we have is healthy radiant skin. The skin excretes waste products, absorbs moisture and protects from infections. If the balance of the skin is disturbed it can result in dryness, excessive oiliness and inability to protect against infections. The natural and best way to begin would be by following a healthy living plan that would include a regular outdoor exercise, enough rest and sleep, sensible stress management, drink lots of water and most importantly have a well-balanced nourished diet. Having enough protein along with antioxidants is the key to glowing skin. Vitamin A not only protects our skin from harmful damage of free radicals but it also prevents ageing and wrinkles. If the skin is protected from getting dry, its thanks to the vitamin A.
Soups, Salads and juices are the healthiest way to consume this vitamin for your skin. We have shared recipes like Green Salad with Muskmelon Dressing, Lemony Tomato Orange and Carrot Juice, Peach Yogurt Smoothie, Super 7 Stress Reliever and many more. To summarize it, make fresh greens and fruits your best friend, avoid those refined and fried foods and keep a chart of your exercise regime – for that lustrous and graceful skin. 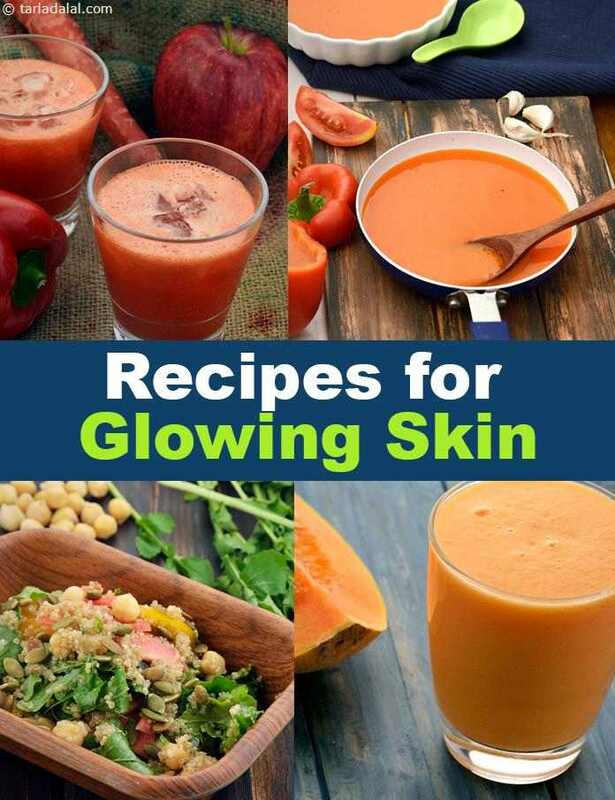 If you liked our Glowing Skin recipe collection, please glance through our below Vitamin articles.